Marie takes a trip to the outback to discover a powerful story from Australia’s history with Sweet Country. Drawing on themes and images familiar from American Westerns, director Warwick Thornton’s story of a lawman looking for a killer is nevertheless a very Australian story. Set in the 1920s, when the land was settled by ‘white fellas’ who claimed it by the mere fact of being there, and effectively indentured the indigenous people of the area as their unpaid workforce, this is a story of injustice and oppression on many levels. Sam Kelly (Hamilton Morris) is one such Aboriginal worker who, finding himself under attack from new arrival and shell-shocked, bigoted war veteran Harry March (Ewen Leslie), shoots the man in self-defense and has to go on the run with his wife Lizzie (Natassia Gorey-Furber). 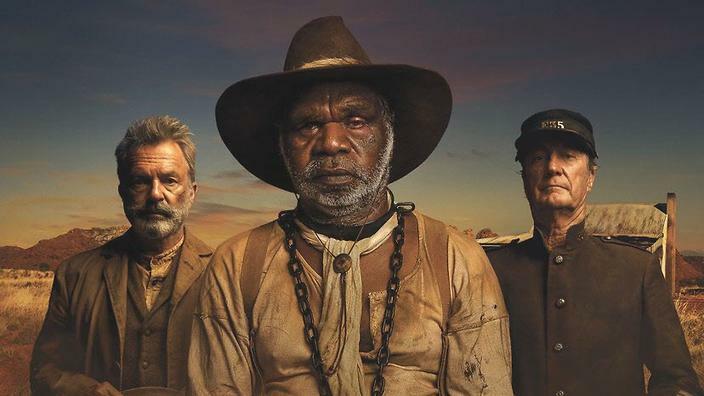 Sam’s boss Fred Smith (Sam Neill) joins Sergeant Fletcher (Bryan Brown), Mick Kennedy (Thomas M Wright) and tracker Archie (Gibson John) to find the pair somewhere in the outback. The catalyst for these events is a teenage Aboriginal boy Philomac (played by twins Tremayne and Trevon Doolan) – his actions unwittingly bring about the events at the start of the narrative, and he is a silent witness to what is happening. He is between the worlds of indigenous and settler; he sees a different role for himself than that of his elders who owned the land before the white immigrants came, and is coming of age during this period of change, much as Australia itself was struggling to find its identity in the early part of the 20th century. As the posse tracks Sam and Lizzie, we see that there is more than just one Aboriginal people. Both the trackers and the chased encounter different tribes of indigenous peoples, indicating that nothing is ever as ‘black and white’ as it might at first appear, and nor is the experience of justice. We’re given a tiny seed of hope that the country is turning a corner, which is crushed with Sam Neill’s character exclaiming “What chance has this country got?” when that seed is dashed underfoot. There is no score, with the filmmaker choosing instead to allow the wind, fire, insects, and wildlife of the outback to be the music, the driver of emotions. It works extremely well and complements the huge landscapes and red soil of the outback. There are also intercut images or ‘flashes forward’ which give the viewer a hint of what is to come, but without specific context so that we can begin to anticipate the outcome – in other words, it’s a foregone conclusion whether we want to accept it or not. It’s no surprise to realize that woman say very little, and white women the least (there are two of them and one says nothing at all, such is her place). The Aboriginal women know when to speak and when to remain silent. Many of the Aboriginal cast are local, first-time actors, and Warwick Thornton has extracted some deeply sensitive and emotionally contained performances from them. It also makes some of the scenes difficult to watch as the characters choose subservience rather than standing up for themselves and having to bear the inevitable consequences.